Harry Potter and the Deathly Hallows is a 2010/2011 two-part epic fantasy film directed by David Yates, written by Steve Kloves and based on the novel of the same name by J. K. Rowling. 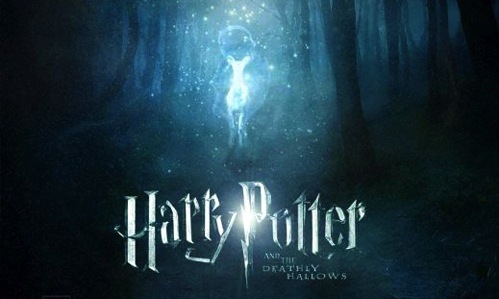 The film is produced by Rowling along with David Heyman and David Barron. The two parts form the seventh and final instalment in the Harry Potter film series, with the story following Harry Potter on a quest to find and destroy Lord Voldemort's secret to immortality – the Horcruxes. The films star Daniel Radcliffe as Harry Potter, alongside Rupert Grint and Emma Watson as Harry's best friends, Ron Weasley and Hermione Granger. Principal photography for both parts was completed on 12 June 2010 (2010-06-12). Part 1 was released in 2D and IMAX formats on 19 November 2010, and Part 2 will be released in 2D, 3D, and IMAX formats on 15 July 2011 (2011-07-15). The film will also be released with D-BOX motion code in select cinemas. Batman's record is safe. Twilight fans' bragging rights are safe. And Hogwarts' finest probably don't care. 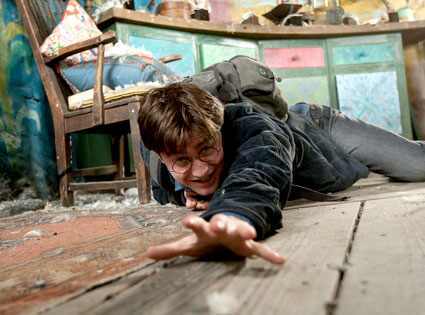 Harry Potter and the Deathly Hallows Part 1 scored a franchise-best $125.1 million opening weekend, per estimates. Where does the movie rank among Hollywood's all-time blockbuster debuts? And what might've been in 3-D? First things first: Deathly Hallows Part 1's opening is the second biggest of the year, behind Iron Man 2's, and the sixth-biggest in Hollywood history, behind the likes of New Moon and all-time record-holder, The Dark Knight. Worldwide, Warners Bros. said, the film has taken in a whopping $330.1 million since Friday's sold-out midnight shows. The scary part of this is that Deathly Hallows Part 1 made its money without the benefit of 3-D ticket prices. "Conservatively, [the studio] probably left about $20-$25 million in another dimension by sticking with 2-D on opening weekend," Exhibitor Relations box-office analyst Jeff Bock said in an email. Warners exec Dan Fellman said there were no regrets. "I think we made the right decision for us and our fans," Fellman said today. "…We will save that [3-D] for the finale." For Russell Crowe's planning purposes, Deathly Hallows Part 2 is set to open next July. Crowe tried opening his new thriller The Next Three Days (fifth place, $6.8 million) against the 2-D Potter, and didn't have much any luck. Elsewhere, Megamind (second place, $16.2 million; $109.5 million overall) got blown out of the top spot, after a two-weekend stay, but didn't get blown away. Denzel Washington's Unstoppable (third place, $13.1 million; $42 million overall) showed OK legs (and it better, considering its $100 million price tag). The Oscar-season drama Fair Game ($1.5 million; $3.7 million overall) cracked the Top 10 despite showing on only 386 screens.